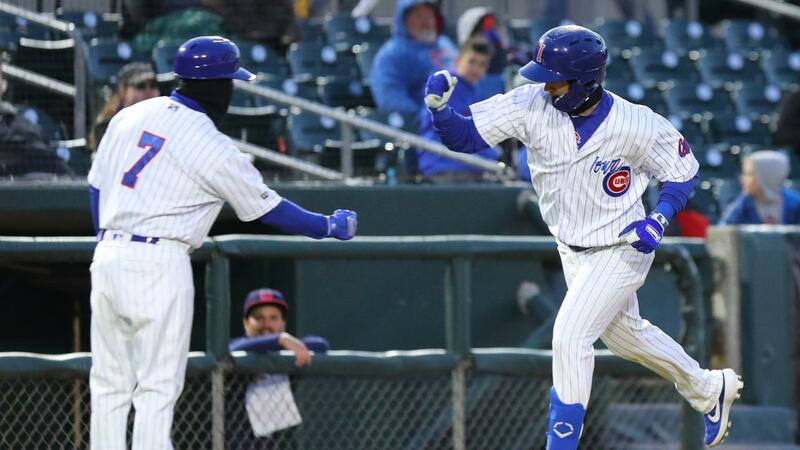 DES MOINES, IA - The Iowa Cubs' (7-3) clutch hitting pushed them past the Oklahoma City Dodgers (4-6) for the second straight game by a final score of 4-3. The I-Cubs were 3-for-5 with runners in scoring position Sunday afternoon at Principal Park. Iowa got the scoring started in the bottom of the third with a Francisco Arcia RBI single, scoring Wynton Bernard after a leadoff triple. The Dodgers got the run right back with a leadoff home run in the top of the fourth inning off the bat of outfielder Kyle Garlick. In the bottom of the fourth, the Cubs regained the lead once again as Trent Giambrone hit his third home run in four games. The I-Cubs added to their lead with a Jim Adduci RBI double that scored Ian Happ in the home half of the seventh. Both teams scored one in the eighth and the Cubs held a 4-2 lead with Dakota Mekkes on the mound heading into the final frame. Oklahoma City scored one and had the game-tying run at third with two outs against Mekkes, but couldn't push the run across the plate as two plays by third baseman Phillip Evans ended the contest. • Trent Giambrone leads all Cubs minor leaguers with four home runs on the season. • Ian Happ went 2-for-4 with two doubles. • Brian Duensing gave Iowa 2.0 scoreless innings out of the bullpen. Iowa and Oklahoma City play the fourth and final game of the series Monday at 12:08 PM at Principal Park. Tomorrow's promotion is Fareway 2-for-1 Tickets. For more information or tickets visit www.iowacubs.com.